Dogs. I adore them. Always have and always will. To me, dogs are angels that walk on this planet with us and accompany us on various parts of our journey through life. Guardians, comforters, companions and endless sources of joy. 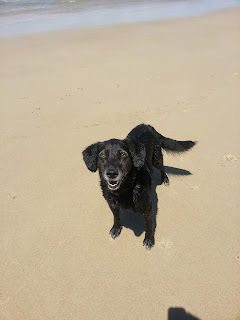 If there is one thing I can depend on in this world it is the total, absolute and unconditional love of my dog. A number of years ago as I was setting out for a new life in Hong Kong, a friend commented that I'd better keep a close eye on my dog because "dogs end up in pots" over there she said - half joking, half serious. I dismissed her words as a joke at the time, thoroughly believing the dog-eating stories of Asia to be exaggerated tales of a practice that was dying out and still only to be found in the more remote regions. Sadly, how wrong was I? Social media has been a hotbed of stories in recent months regarding the dog-eating trade in Asia and attention has focused in particular on the upcoming Dog-meat "festival" in Yulin, China. 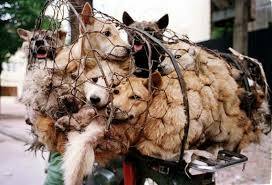 I think to call what takes place in Yulin a "festival" is a gross misuse of a word which implies something is being celebrated. The torture and barbaric slaughter of thousands of dogs is most certainly not a celebration but a blight upon the world and an event that deserves all the international condemnation it has received in recent months. Those who defend it do so in the name of culture and "way of life" as if this means it is somehow excusable and shouldn't be questioned. Whereas the local authorities have officially banned the event it is still expected to go ahead as the ban doesn't seem to extend to actually taking action to prevent the slaughter and is more of a saving face exercise than anything else. Meanwhile, the ruling proletariat in Beijing are content to sit back and do nothing. Well that is simply not acceptable. If customs, superstitions and the "way of life" argument were acceptable arguments for doing nothing then we'd still have gladiators fighting each other to the death, witches burning at the stake and kings, queens and emperors ruling empires. The Chinese authorities have shown themselves well capable of tackling cruel practices before, such as foot binding, now completely eradicated throughout China but a common practice till very recently. This was even more embedded in the Chinese psyche than dog-meat and is now gone as a result of the Communist Party banning it as a consequence of many campaigns by conscious objectors both inside and outside of China. Thankfully, there are a growing number of animal welfare activists in China who are trying to to do something about the Yulin situation and the dog-meat trade in general. It is thanks to them and their use of social media that the rest of the world is aware of what is going on. We can't stand with them in Yulin to physically rescue these unfortunate animals from their terrible fate but we can stand with them on facebook, twitter, and every social media site available to us and let them know we support them and their efforts. 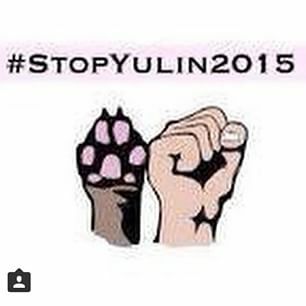 Share the hashtag #StopYuLin2015‬ and do one small thing for the animal we all know as man's best friend.